Let me say from the start that Daniel Craig is one of the finest actors having played James Bond, maybe the best since Sean Connery. Judy Dench is also the best M. ever, and the idea of a female M. is just genial. Yet, the series are in trouble, and something needs to be done to save the series from the downturn that seems worst than the world economy. I will call the film QOS because the name requires a non-native English speaker to use a dictionary to understand it - and this is one of the many small problems that make a big disappointment. Another one is the unconvincing evil character. Another one is the lack of global threats in the intrigue - to justify the immense destruction and number of widows and orphans left on the track a James Bond movie must invent something more interesting than the water supply of Bolivia revealed as the big motivation way into the film. The action scenes themselves are well made, but too fast, too many, to confuse to help the viewers understand what is going on and care beyond the pure aesthetics of destruction. Bringing on the set fine actors and redesigning the character into a human being with real feelings as well as into a darker Bond fit to the world of today is a great idea. It is not enough though. Bringing good script writers is even more important. Oh, and yes, please bring back Q. and please have Bond say at least once 'My name is Bond. James Bond'. There is no such thing as a good Bond film without those. This film marks the return of the "traditional" gun barrel sequence, albeit at the end of the film, as opposed to the beginning. 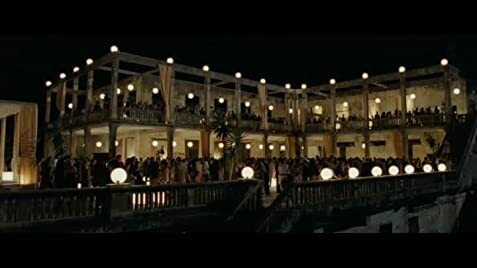 Similarly, Casino Royale (2006) incorporated the gun barrel sequence as part of the opening fight scene. The following film, Skyfall (2012), also uses the sequence at the end. These three films are the first to break away from the "traditional" use of the gun barrel sequence at the beginning of a James Bond film, which was used for the last time in Die Another Day (2002). Carabinieri on Radio: Station from Patrol 48 - grey Aston Martin followed by a black Alfa Romeo driving towards the quarries. Gunshot fire. There are no deserts in Bolivia. There is an expansive salt plain in the SW portion of the nation. However, while this could potential be arid like a desert, it is not a true desert like the one shown in the film. The iconic "James Bond gun barrel" sequence, not seen in its traditional format since Die Another Day, is incorporated into the closing credits. Following an advisory screening of a rough cut the film was pre-cut on BBFC advice before official submission to the Board for a formal cinema classification, with edits made in two scenes in the finale. At this point it was officially passed "uncut" as a 12A. More detailed notes can be found on the BBFC's website. Worldwide versions are this same pre-cut version.